Giving treats is now rewarding for the both of you. 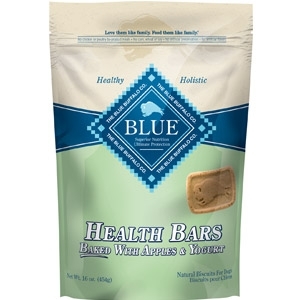 Natural BLUE Health Bars are satisfying for your dog (just watch him happily crunch away) and healthy for him too. While most treats contain corn or wheat, BLUE Health Bars don’t. Instead, our biscuits include wholesome whole grains and vegetables, and are fortified with Omega 3 fatty acids.